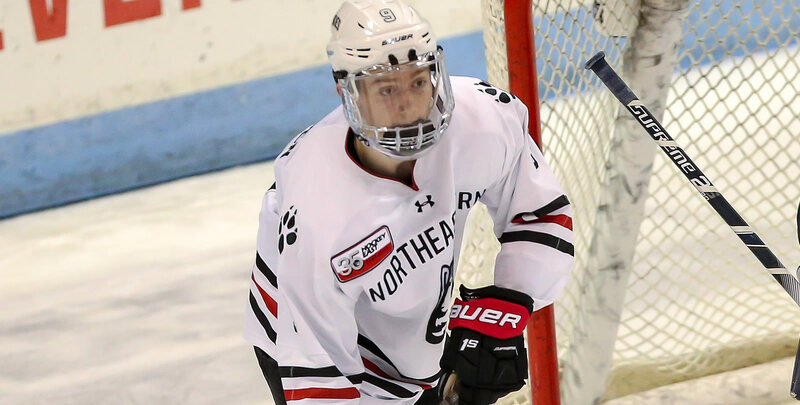 #1 Massachusetts and #8 Northeastern battled to a thrilling weekend split in league play over the weekend, as televised on NESN and NESNplus. The Minutemen thwarted the Huskies, 6-1, on Friday thanks in part to three points (1g, 2a) from sophomore Jacob Pritchard (Macomb, Mich.). Pritchard scored the game-winning goal and picked up his ninth multi-point game of the year in the outing. Cale Makar (Calgary, Alta.) posted a career single-game best with three assists Friday. The next night, Pro Ambitions Rookie of the Week Tyler Madden (Deerfield Beach, Fla.) provided overtime heroics, securing a 2-1 win for the Huskies on a full-ice rush. 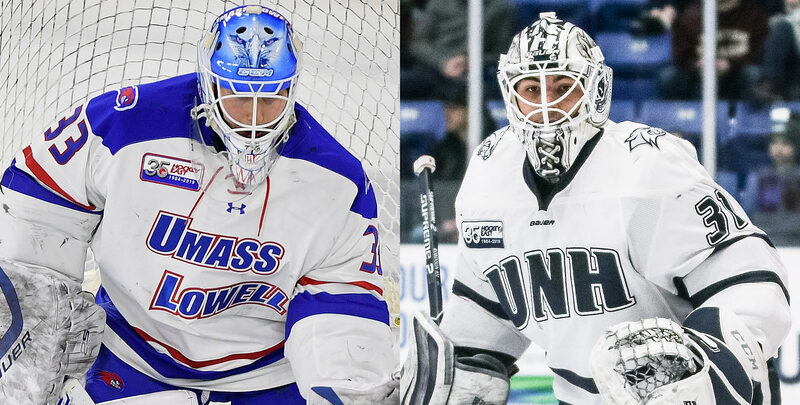 UMass Lowell swept Vermont in a two-game home stand that saw an explosion of offense. Senior Ryan Dmowski (East Lyme, Conn.) recorded both game-winning goals for the River Hawks, finding the back of the net with less than seven minutes left in Friday's 6-5 win and opening the scoring halfway into the first period of Saturday's 2-0 win. Tyler Wall (Leamington, Ont.) posted a 25-save shutout in game two. Boston College earned an important league victory on Saturday, toppling #10 Providence, 4-1, at home. Christopher Brown (Bloomfield Hills, Mich.) netted a pair of goals, including converting on a third-period penalty shot, to help the Eagles to victory. The penalty shot was the first successful penalty shot goal for the Eagles since Austin Cangelosi scored against Air Force on Oct. 7, 2016. The win kept the Eagles in the third slot in the Army ROTC Hockey East Standings, just two points out of first. Providence retained the Mayor's Cup with a 5-1 win over Brown on Tuesday. Four players recorded multi-point games as the Friars snapped a three-game winless streak. Josh Wilkins (Raleigh, N.C.) extended his career-long, and NCAA-best, point streak to 13 games (7-12-19). He leads the Friars in scoring with 26 points overall and has scored a goal in three-consecutive games. 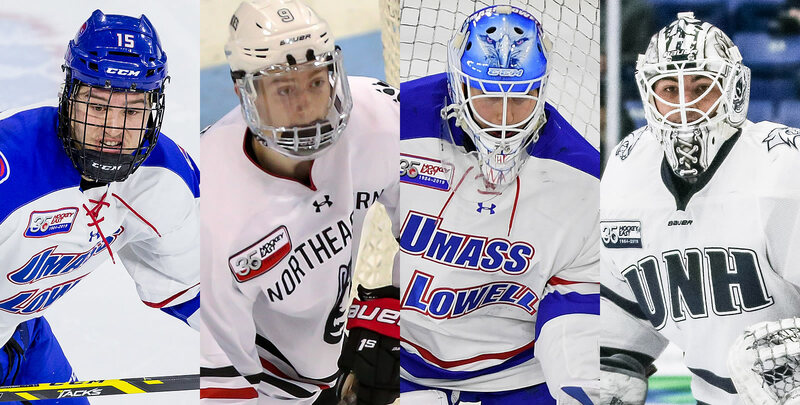 Two games are on the Hockey East docket for this Monday holiday. New Hampshire travels to Maine for a 2pm puck drop, while Merrimack visits Boston University at 4pm in a game that can be seen on NESN. Ryan Dmowski (Sr., F; East Lyme, Conn.) recorded two game-winning goals in the weekend sweep of Vermont at the Tsongas Center, including the game-winner in the 6-5 win Friday with less than seven minutes left in the contest. He added a plus-two rating and six shots on goal in the Vermont series. Tyler Madden (Fr., F; Deerfield Beach, Fla.) found the back of the net twice over the weekend, including the game-winning goal in overtime on Saturday, lifting the #8 Huskies to a 2-1 overtime win over #1 Massachusetts. It was the first win for Northeastern over the top-ranked team in the nation since 2012. Tyler Wall (Jr., G; Leamington, Ont.) posted a 25-save shutout in his only appearance last weekend, a 2-0 victory on Saturday. The blank sheet was his third shutout of the year and sixth of his career. He stopped 12 shots in the second period alone to backbone the River Hawks to a weekend sweep over Vermont. Mike Robinson (So., G; Bedford, N.H.) Posted his second shutout of the year in a 5-0 win at Merrimack on Friday night, making 25 saves. On the year, he has .920 save percentage and 2.26 goals against average. He's helped the Wildcats to a 6-1-1 mark in their last eight games. Christopher Brown, BC (Sr., F; Bloomfield Hills, Mich.) Netted a pair of goals, including converting on a third-period penalty shot, to help Boston College to a 4-1 win over #10 Providence on Saturday. The penalty shot was the first successful penalty shot goal for the Eagles since Austin Cangelosi scored against Air Force on Oct. 7, 2016. Ty Amonte, BU (So., F; Norwell, Mass.) Scored a shorthanded goal and added an assist in a 4-3 setback to #7 Quinnipiac on Saturday. Jacob Pritchard, UMass (So., F; Macomb, Mich.) Tied his season-high with three points (1g, 2a) in Friday's 6-1 win over #8 Northeastern. Pritchard scored the game-winning goal and picked up his ninth multi-point game of the year in the outing before adding another assist in Saturday's 2-1 overtime loss. His 28 overall points (10g, 18a) lead the Minutemen. Cale Makar, UMass (So., D; Calgary, Alta.) Posted a career single-game best with three assists in a 6-1 victory over #8 Northeastern on Friday, his seventh game with at least two points this season. He finished plus-two with four shots on net in the win. 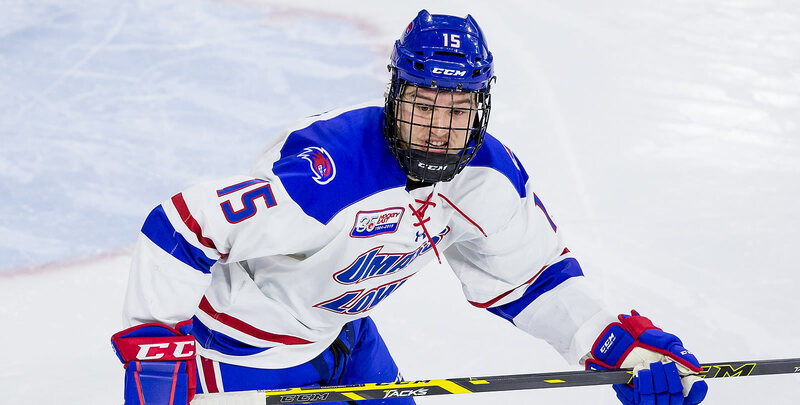 Ryan Lohin, UML (Jr., F; Chadds Ford, Pa.) Totaled three points (1g, 2a) and five shots on net in a weekend sweep of Vermont, including two points (1g, 1a) in a 6-5 home win on Friday. Eric Esposito, UNH (Fr., F: West Haven, Conn.) Scored the first goal of the game in a 5-0 win at Merrimack on Friday night, the first game-winning strike of his career. The rookie now has two goals and two assists on the year. Cayden Primeau, NU (So., G; Voorhees, N.J.) Tied a career high with 45 saves against #1 UMass on Saturday night, backboning the Huskies to a 2-1 overtime win over the Minutemen.